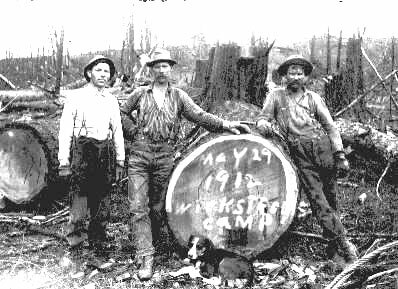 THIS PHOTO TAKEN NEAR KALAMA, WASHINGTON FEATURES FRANK WIKSTROM ON THE LEFT. If you are going to be in the logging business one of the things that you have to do is to learn about heavy equipment. Trees are heavy and you must be able to handled them quickly and efficiently (and safely). 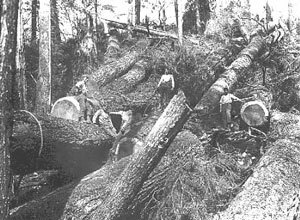 Loggers began to mechanize at the begging of the 20th century in the Pacific Northwest. For example, this writer's great grandfather was an old country Swede who settled in the St. Helens > area in the 1880's. He began logging with bull teams. which were used to drag the logs to the water (Columbia River) where they would be rafted and moved to market. "Greasing the skids" meant just that. Poles were layed crossways of the skid trail and the lead end of the log would be 'sniped' (tapered slightly with an ax), and lard or whatever was available would be applied to the skids to "grease the skids". Steam was first introduced to the logging operation in the form of a small steam donkey. The donkey would consist of a steam boiler and steam engine connected to a winch all mounted on a 'sled' called a 'donkey sled'. The donkeys were moved by simply 'dragging themselves' with the winch line. The process evolved rapidly, but donkeys were used for both yarding ( moving the logs from when the tree was cut to an assembly point) and also 'skidding' (dragging the log down the skid trail to the river.). Thus the loggers soon had 'yarders' and 'road donkeys', the latter being the name applied to donkeys strategically located along the skid road to drag the logs from point to point toward the river. In the picture at the left, the man in the white shirt is Frank Wikstrom, a relative of the VanNatta's. Soon, however, the trees near rivers large enough to float logs had been harvested and it was necessary to reach farther and farther out into the woods. Shortly after the beginning of the 20th Century, railroads began to be used commonly (at least in Columbia county) to "get the logs out". Frank Parcher of the Parcher family of Beaver Valley (West of Rainier) told of going to work in the woods when he was age 9. He got a job as a 'whistle punk' for the Yeon and Pelton who were logging in the Beaver Valley area just west of Rainier. The time would have been around 1905. 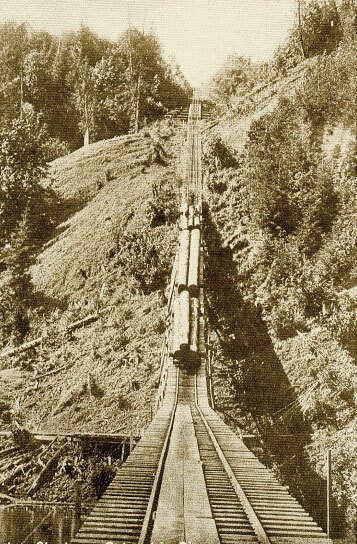 Yeon had built a railroad incline (a steep track straight down the face of about a 500 foot high steep embankment--For more see link at bottom of page) from the Beaver Valley grange over the face of the hill and into West Rainier. He had trackage built out from the incline and logs were brought to the incline and let down to the river level with winches (and a counter balance on a second track). At that time they were 'ground logging' which implies that they had a donkey by the tracks and were reaching out with winch lines 300-500 feet and dragging the logs on the ground to the tracks for loading on the train. Since the choker setters would be working at a distance beyond which the "donkey puncher" (operator) could see what was going on, it was customary to string a long line out into the woods connected to the steam whistle which was always present on the steam donkeys. A series of 'whistle codes' provided both instructions to the donkey puncher and also warning to those around as to what was going to happen next. A quick way to become a logging casualty was to get into the 'bite of the line' (the area over which the cable would snap as it came tight). As cable logging evolved loggers learned that uphill logging was best. 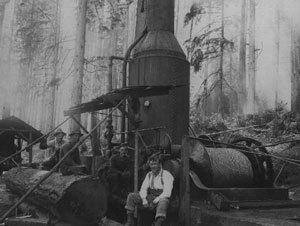 Unlike early logging which involved attempting to use gravity to get a log to the water, with the introduction of steam to the woods there was plenty of power. Now the problem was with logs that would get snagged, or hooked behind stumps making them difficult to get out. The stumps were often cut 4 to 10 feet high to get above the but swell (they were sawing by hand) and to avoid the bind and pitch were was more plentiful in the stump area. If you are trying to drag logs downhill the stumps are all effectively 'fish hooks' frustrating the task, but if you are dragging the logs uphill, (the steeper the better) the geometry implicit in the task implies that the logs will 'pop over' the stumps, or if the hill is steep enough (overhanging cliff) swing free of the stumps. In the evolution of things, the railroads headed for the high ground (ridge tops) and skyline logging came to be. Tall trees on tall hills would be rigged with blocks in their tops near the tracks and a similar tree (called a tail tree) would be rigged a considerable distance away (ideally the next ridge top). A skyline cable would be hung between the 2 trees and some sort of a carriage would serve as the 'hooking point for the logs. One of the interesting logging engineering issues deals with successful rigging. The issue is called 'deflection'. In logging terms this is the amount of 'sag' in the cable from point 'a' to point 'b'. If you try to pull half a mile of heavy cable up 'straight' like a guitar string, it will likely break of its own weight before all the sag comes out. It follows that the more sag you have in the skyline, the greater the capacity. Conversely, if you can get the skyline high above the ground and lift the logs a lot they will come free of the ground and move a lot easier. If you think about it you will understand why cable loggers never found a hill too high or a canyon too deep for a cable logging operation. The steeper the ground the better they work. For more about cable logging be sure and visit the VanNatta Iron Museum and pay particular attention to the Washington TL-6 Trakloader and the Thunderbird yarder Although the information here relates to somewhat newer machinery, the cable logging techniques haven't changed much in 75 years. See also Larry Rea's History of Columbia County for more information on Columbia county, and the West Side Lumber Co. Page for information on logging in the Sierra's. For history closer to home read about the End of the Oregon Trail Intrepretive Center.